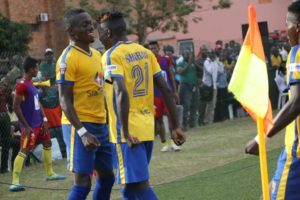 KCCA’s Paul Mucurezi(left) celebrating his goal against CNaPS with Shaban Muhammed(right),in the preliminary round of the CAF Champions league. KCCA FC won the game 1-0 to progress to the first round. KCCA FC players and staff have arrived safely in Addis Ababa, Ethiopia as they prepare to take on St. George in the CAF Champions league on Wednesday. A contingent of 32 personnel departed Entebbe Airport this morning at 2:45 am and arrived at their destination at round 10:00 am. The personnel include 18 player, nine coaches and five administrators. KCCA will be in Ethiopia where they will carry out two training sessions as they get ready for the first round of the Champions league. The Kasasiro Boys defeated Madagascan side CNaPS on away goals rule in the preliminary round of African club show piece while St. George progressed via a no contest as South Sudanese side Wau Salaam failed to honour any of their two fixtures against the Ethiopian reigning league Champions. St George has never faced off with a Ugandan side in the Champions league and have always featured prominently in the competition. KCCA’s Contingent that is in Ethiopia.